If you are system administrator or doing a project for example where you are developing server roll-out you probably getting annoyed starting up the Microsoft RDP Client for every server you would like to connect to. So you are using Microsoft's MMC snap in Remote Desktop, but are getting crazy that the mouse on regular base stays within one of the sessions, while you are working in another session. If you are working at different customers you are probably getting nuts of remembering all the different user accounts and passwords. Combining all these annoyances you are searching for a tool where you can store your credentials, logically order all the servers and is working perfectly (in stead of the MMC Remote Desktops) and if possible for free. Probably the consultants of VisionApp had exactly the same feeling and created VisionApp Remote Desktop. Let's take a look of this freeware product can satisfy are needs. Update: VisionApp Remote Desktop is no longer available as a freeware utility. The product can be downloaded (after registering) from the VisionApp website and exist of a single MSI file. During the installation the only parameter that needs to be filled in is the destination directory for the files. Of course adding the password is a security risk. Therefore you can also configure that the application should prompt for a password. Within the connection part you can first configure folders where the connection can be stored. You can create folders within folder so you can create a customer and for example dividing the connection by role. 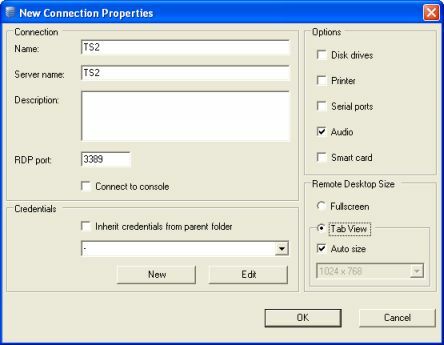 In the connection part you con complete configure the settings for the RDP Settings. Of course you need to specify the server name. Also the RDP port, RDP settings (for example disk drives, clipboard, audio mappings and client printers) and the possibility to connect to the console can be configured. Logically you can set the needed credentials configuration to use for this connection. The credentials configuration can also be assigned to a folder. In this way you can configure that the connection should inherit the credentials settings. What I really find useful is the import and export function. In this way you can quickly share your configuration with you colleagues. It is possible to export (and import) folder structures, so you also share parts of your vRD configuration. Logically it is not possible to export or import credentials configuration. 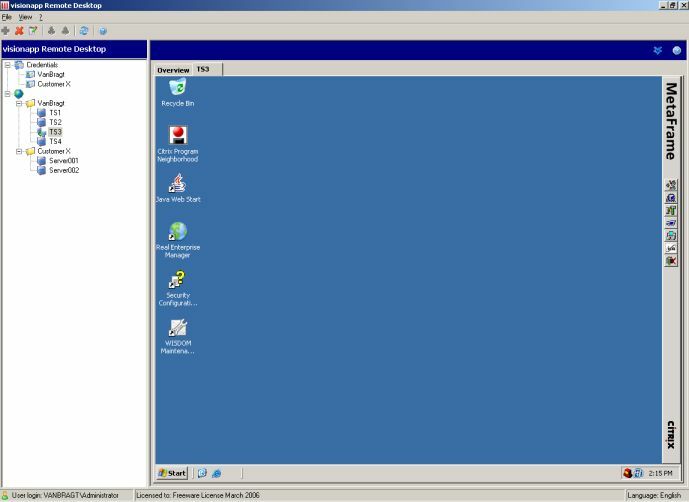 vRD is nice wonderful freeware tool which you can use perfectly to access all servers via RDP. The product has an easy interface and all the configuration options you can think of. Also the import and export function is good option. It is useful for both consultants which are at several customers as for system administrators which administrate a lot of servers. Download vRD from the VisionApp Website (registration required).